Donald Trump at the best golf course in the world (his). Since the beginning of his presidential campaign, Donald Trump has prided himself in the more than $102 million he’s reportedly given to charity in the past five years. “It’s one of the things I most like doing and one of the great reasons to have made a lot of money,” he told the Associated Press back in August. But even in that August interview, something seemed off — the AP noted that “the Trump campaign did not respond to a request that it identify donations that Trump himself gave.” Now, it appears the campaign had a very good reason to keep mum. According to a Washington Post investigation into an exhaustive list of Trump’s charitable donations — 4,844 contributions filling 93 pages — not a single donation was of Trump’s own money. Instead, most donations came from the Donald J. Trump Foundation, which didn’t receive a personal check from Trump between 2008 and 2014, according to public tax filings. Although Trump decides where the foundation’s money goes, most of it comes from third-party donors. What’s more, it appears that most of the foundation’s gifts are closely tied to Trump’s business dealings and political ambitions. In the past five years, it has given to the American Cancer Society, the Dana-Farber Cancer Institute, and the Leukemia and Lymphoma Society, all of which have held fundraisers at Trump’s Mar-a-Lago Club in Palm Beach. The largest donation listed — $158,000 — went to the charity of a man who was suing him. 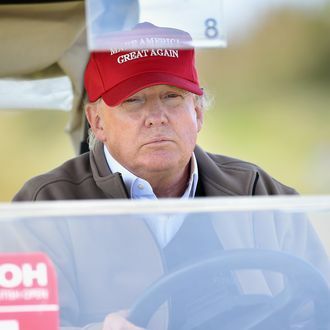 Many of the donations also came in the form of freebies to Trump-owned businesses; the Post estimates he claimed credit for 2,900 free rounds of golf, 175 free hotel stays, 165 free meals, and 11 spa gift certificates. But in at least one case, Trump’s accountants overvalued the amount for which his free golf rounds sold at a charity auction. A spokeswoman for the tennis star said she had attended a ribbon-cutting at Trump’s Loudoun County, Va., golf course that year for a new tennis center. But Trump hadn’t donated to her charity. Instead, he had given her a free ride from Florida on his plane and a free framed photo of herself. How generous of Trump to give the world’s 47th highest-paid athlete a free plane ride. And a framed photo. Of herself.